Neighborhood Kasbah, with access car in front of the riad door to renovate of 9 rooms. District Ben Salah, riad of 180 m2 titled deed, to renovate, 4 sides with a large patio. Car access at 20 m.
Kasbah district, Riad to renovate a floor area of 135m2, perfect concrete structure undamaged. Riad to renovate, Kasbah district, car access easily. 200 m2 floor, very good structure, current 6 parts. 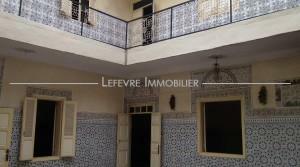 Riad Laarous district, very good location, riad of character to be renovate 232 m2 titled deed, consisting of 8 rooms (several living room, bedrooms, bathroom). Very nice Riad located in the Kasbah, overlooking the gardens of the atlas and fixtures. Beautiful riad with very spacious rooms, excellent concrete structure, possibility to 8/10 rooms, district Riad Zitoun and Jdid, parking nearby. The property is titled deed.